John Suttman is an artist whose work involves unexpected function and the discovery of hidden beauty. A china cabinet threatens to fall over while another seems ready to dance. A chair is poised to join Alice’s tea party. And that beautiful wood finish is not wood at all, but a rich combination of patina and paint on steel. 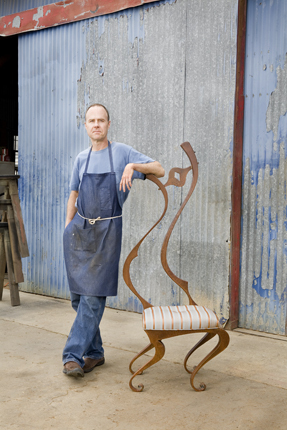 Welcome to the world of John Suttman, designer, sculptor and furniture maker extraordinaire. As a college student at the University of New Mexico, Suttman worked in many mediums and upon graduation began a successful career as a designer/fabricator of high end fashion jewelry. Ultimately his interest in furniture and predilection for metal fabrication merged. “Furniture,” says John, “is all about people. It’s our alter ego.” John playfully tweaks and distorts familiar objects, turning them into works of art. In addition to furniture, he enjoys designing and building gates, using steel as his canvas. One project was a series of gates designed for the historic La Posada Hotel in Winslow, Arizona. John Suttman’s documentation took place in 2007 and was sponsored by Sandra and Jordan Laby and Jo Ellen and Stephen Lee. The FOTM Archive contains extensive information about this artist.